The Bəna, Yungur, and Mboi peoples living in the eastern Gongola River valley have long made wood representations of deceased male chiefs, to whom they appeal each year for good rainfall and bountiful harvests. These simple, highly schematic effigies largely take the form of posts with overhanging faces that stand upright when inserted in the ground. They are displayed during pre-planting festivals and at the funerals of important elders as a way of collectively honoring past chiefs and ensuring their beneficence. Ancestral figures were still being made in the early 1980s and stored, along with ceramic vessels and the skulls of deceased chiefs, in caves high in the steep granite hills where these peoples live.1 Radiocarbon dating indicates that this particular figure may be over 500 years old, making it and similar ones among the earliest know wood sculptures in Nigeria. Although most older examples are highly eroded and damaged by termite infestations, the Menil figure is less worn and may be the best preserved of them. It is certainly distinguished by its remarkably robust muscularity, which is not seen in any other known wood sculpture from the Gongola River valley. The earliest evidence of these sculptures comes from the British anthropologist C.K. Meek, who in 1931 wrote that Yungur sculptures of “earth Priests” were carved and then dressed in a cap, gown, and sandals for the pre-planting festivals.2 The particles of red iron oxide (hematite) that survive on the surface of this example point to the Bəna practice of rubbing the effigies with red oil when they are brought out for post-burial and pre-planting festivities. Powdered hematite mixed with oil is widely used in the region to mark social and spiritual transformations. The figure bears a strong resemblance to several of the sacred ceramic vessels made by the Yungur. Called wiiso, these anthropomorphic vessels each contain the spirit of a particular deceased chief. Wiiso dedicated to specific ancestral lineages are kept together in local shrines. Although their facial features vary widely, several wiiso said to have been brought from the Yungur sacred homeland of Mukan bear a striking likeness to the head of this figure. This is evident in the contours of the face, especially viewed from the side, and in the ears (rendered as perforated disks), eyes, pointed beard, and coiffure or head crest. 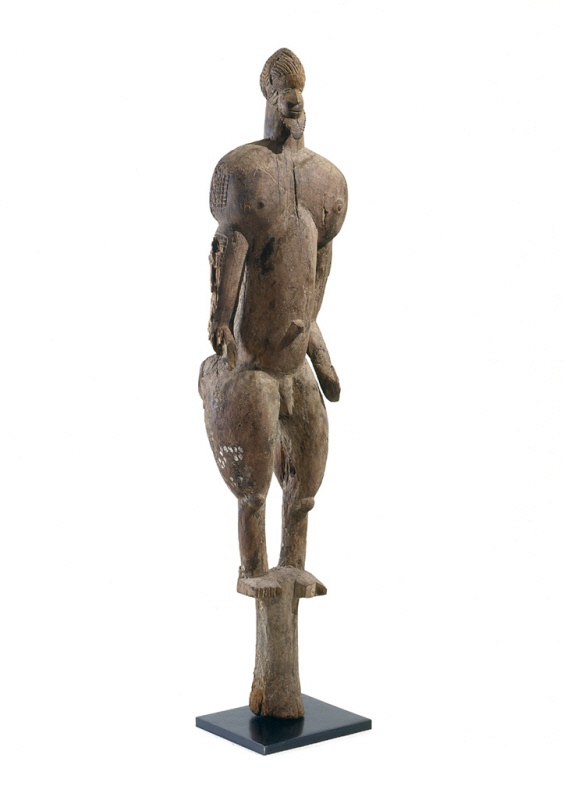 The uncanny resemblance cannot be ignored, suggesting that the Menil figure has a similar association with Mukan. It is possible that the use of ceramic vessels replaced the earlier use of wood in representing male ancestors by the Yungur as well as by their Mboi and Bəna neighbors. Without further information it is impossible to attribute this sculpture to any one ethnic group, but the evidence suggests that is should be identified with this cluster of related peoples. 1. Marla C. Berns, “Art and History in the Lower Gongola Valley, Northeastern Nigeria” (PhD diss., University of California, Los Angeles, 1986). 2. Charles Kingsley Meek, Tribal Studies in Northern Nigeria, 2 vols. (London: K. Paul, Trench, Trubner, 1931). 3. Marla C. Berns, “Pots as People: Yungur Ancestral Portraits.” African Arts 23 (no. 3) (July 1990): 50–60, 102.